Although rubber hoses are still commercially available, since 1960 these have been gradually replaced by PVC (polyvinyl chloride) for its competitive price. PVC offers the advantages of long-term use and durability under a big range of conditions and at highly competitive prices. the flexibility with which it is possible to bend and twist PVC without breaking it is one of most crucial features that contributes to make this material particularly suitable for all type of applications. based on the plasticizer used, the manufacturers are able to produce a rich variety of shielding for specific applications. Manufacturers can accurately select the level of flexibility necessary to satisfy the mechanical needs of the final use. 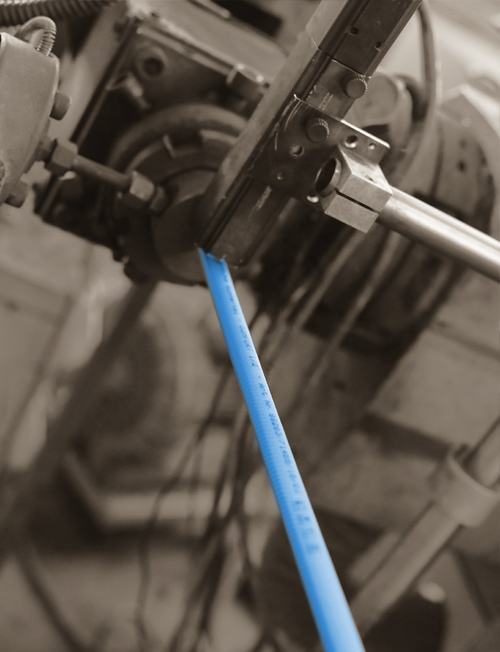 Hose production starts with raw material which is usually composed of PVC compound, additives and colourings. Also available in either granular consistency, when heated at the right temperature, PVC achieves its tensile strenght whilst the inner core of the hose takes shape. After the extrusion, the inner core has to be cooled by putting it in water. 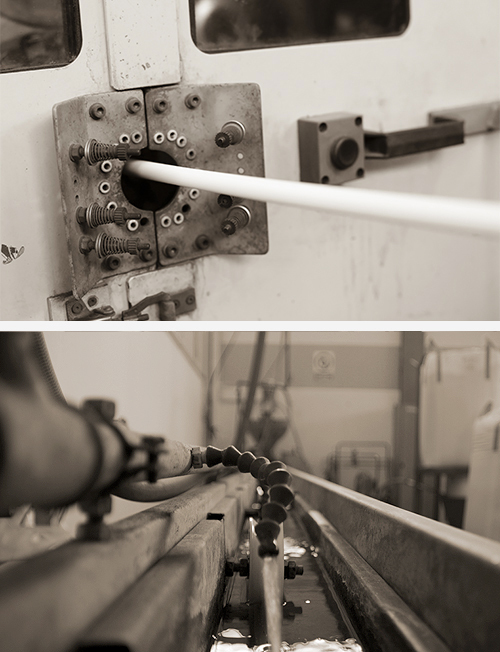 For hoses with no textile reinforcement, production ends here. What is left to do is winding and ackaging. For textile reinforced hoses, the inner core, which is at room temperature, goes through a braiding or knitting machine, depending on the type of reinforcement. At this point the textile inside liner is heated once again before going through a second extruder which constitute the hose coating. A new cooling phase will take place through water immersion before being ready for winding and packaging. During the whole process, a light air pressure is kept inside the hose to avoid flattening. PVC hoses currently on the market are divided into two categories. In Italy, those with no textile reinforcement are identified as monolayer: they are simple single-layer PVC hoses. The second category known as STRUCTURED or REINFORCED is produced with one or more textile reinforcement within the hose itself. Textile reinforcement, commonly made of polyester, is divided in two main types: BRAIDED and KNITTED. The types of reinforcement provide different carachteristics. In the BRAIDED hoses the textile reinforcement is made up of two sets of spirals threaded in the opposite direction around the core. BRAIDING gives a greater resistance to water pressure as fibres are pressurised along their axis due to the expansion caused by the water itself but, as a result, the hose is more rigid. In the KNITTED hoses the textile reinforcement is made from woven tricot wrap around the core. KNITTING offers greater flexibility and handiness due to the expanding capacity provided by the tricot knit. The combination of both braiding and knitting reinforcements provides the hose with unique features creating a product which is at the same time flexible and pressure resistant. It is one of the most essential peculiarity as the force applied by water inside a hose whose resistence is inferior to those required, causes the hose to dilate and even explode if too strong. In minor cases it may provoke the detachment of layers and/or the weakening of the textile reinforcement, resulting in the hose becoming unusable. The algae proof layer is very important as it prevents algae formation inside the hose as a result of photosynthetic effects. In order to maintain the features of the product unaltered and guarantee its long lasting, it is advisable to always wind the hose after use and avoid direct exposure to weather conditions. produced with a phtalate-free formulation. REACH is the new European Regulation on chemicals and their safe use. Energy efficiency and environmental responsibility: the values that guide our work.